The Euclid High Schools Distinguished Achievement Hall of Fame recognizes outstanding achievements by graduates of Euclid, Shore, and Central High Schools as other individuals who have made significant contributions to the students of Euclid City Schools. The event takes place every spring. In addition to this year’s inductees, we honored Donna Sudar as the first recipient of the Joseph P. Mayer Community Engagement Award. Distinguished Achievement Hall of Fame Inductees have plaques that are hung in the hallway of Euclid High School outside the Auditorium. Please note that Plaques for Distinguished Achievement Hall of Fame Inductees from 2010 on will be displayed upon completion of the upcoming renovations to Euclid High School. In the meantime, their names are displayed in one of the cases. Must be an alumnus of Euclid, Central, or Shore High Schools who have distinguished themselves in their careers and graduated at least ten years ago. May be people who are not alumni but who have made significant contributions to the students of the Euclid Schools. May not currently be on the staff of the Euclid City Schools. Joe Mayer was a dedicated Euclid resident and champion of the city and the schools who devoted his life to serving the city and the schools, its students, and its alumni. Joe was a graduate of Shore High School, teacher and administrator in the district, and founded the Euclid Public Schools Alumni Association and served as its director for many years. 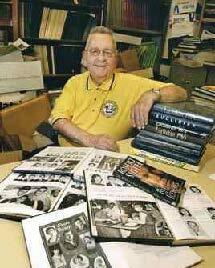 In addition to his contributions to the schools, Joe tirelessly served the Euclid community. This award was created in his name after his death in 2018 to honor individuals who have contributed to the advancement of the Euclid Public Schools and city of Euclid through service and leadership in the spirit of Joe Mayer. The first recipient will be announced at the 2019 Distinguished Achievement Hall of Fame Induction.